PIG Collapse-a-Tainer Containment System provides portable drive-in containment in minutes. 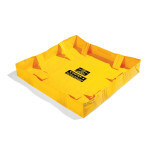 This unique lightweight product keeps customers prepared for large leaks in remote locations. 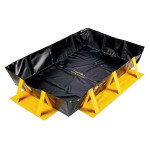 Collapsible sidewalls allow the unit to fold easily and tough geo-membrane resists harsh chemicals.